and healthy community for the future prosperity and sustainability of "T0M 0R0". Welcome to the Village of Cremona, the "Village of Tomorrow". 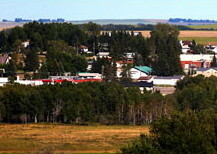 Located in Mountain View County in south-central Alberta, Cremona was named after Cremona Italy, home of the Stradivarius Violins. Cremona is a vibrant and energetic community and is working toward realizing its potential as a prosperous and viable community. The Village joined the Communities in Bloom program in 2014, and, as the judges said, their first impression was of a clean and tidy community, at the "anything is possible" phase. Cremona has a very nice blend of businesses for your shopping pleasure. Our businesses are a mixture of small-town friendliness and personal service. We are very proud of active Family & Community Support Services programming. 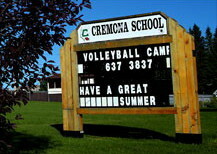 The Cremona School is part of the Chinook's Edge School Division and includes Grades ECS through 12. Our School Library has a vast array of programming opportunities, as well as being home to a full-time operating Community Engagement Site. The Municipal Library is part of the Parkland Regional Library system, and provides internet and computer access for the public. Our emergency services are led by an active volunteer fire department. Cremona is home to a fascinating museum with a wealth of history and many photos and artifacts from the past. The community supports a variety of cultural and recreational opportunities for residents and visitors. We hope you will enjoy your visit here enough to make Cremona your home. Garbage pick up has been delayed but should be completed by end of day today. 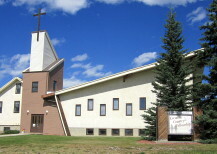 The Village of Cremona is currently looking for a Chief Administrative Officer. Job description and further information on our Administration page. The March Village Voice is now online. Check it out and stay updated on what's happening in town. 2019 Assessment Notices were mailed out on March 8, 2019. Please watch for yours over the next couple of weeks. Final date for assessment complaint is May 14, 2019. 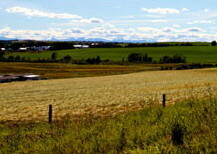 For concerns regarding your assessed value, contact the Village Assessor, Steve Washington, 403-764-3357. The March/April FCSS Newsletter is now online. Please click here to read what's going on in town. Have you seen our latest video? Check it out on our Visitor Information page. The final Green Bin pick-up of the year was Wednesday November 14, 2018. Service will resume in April 2019.